Forgive us both for not writing of late. There has been a lot going on in our lives, and with winter approaching I am turning my attention to renovating a house near Dexter. Once finished my wife and I will put our current home on the market and move. There is still a chance Tom and I will get out on the river again this year, but only if weather and circumstance cooperate. We left off in Ada, and will finish our paddle of the Grand next summer. That being said, I will be talking about our journey down the Grand at the Ignite Ann Arbor 11 event. This will take place on Friday evening, November 2, at the downtown branch of the Ann Arbor District Library. My talk will focus on the theme of getting out of one’s comfort zone as illustrated by our quest. Please introduce yourself if you’re there, I’d love to meet you. Let the renovation begin! This was Linda’s dad’s house; needs a lot of work but has great bones. Ottawa Sands, a 353-acre preserve of dunes which includes more than a mile of Grand River frontage and a pristine 80-acre lake is now open to the public in Ferrysburg, near Grand Haven. These are the dunes I hiked as a boy. Somewhere back there is a tree with JN + PS carved into its trunk at 12-year-old boy’s carving level, although I suppose it has moved upward in the ensuing 50 years . I can’t wait to explore . . . for the first time in decades. Maybe Billie Koski and I can hike from North Shore Rd. to the Sag for some bass fishing as in days of old. Upstream from the new preserve in Kent County a new kayak launch was opened in Grandville recently. Getting Michigan residents out on their rivers is a good thing. PFAS being found throughout the Grand’s watershed . . . in the Rogue and in the waters of Lake Michigan near Grand Haven. What hath we wrought? There is a plan afoot to make the Grand River navigable to larger pleasure boats from Grand Rapids to Lake Michigan. This would require dredging a 50-foot wide, 7-foot deep channel for 23 miles. On the one hand I’m in favor of encouraging recreational use of our rivers in Michigan, and in this case that includes power boats. On the other hand, what will such dredging do to the fish and wildlife? What about pollutants which are currently buried? Will dredging release them once again into the Grand, from whence they can flow into the Big Lake and poison the entire region? I’m not sure how to think about this yet. I lean towards returning the river, incrementally, towards its “natural” state whenever possible – get rid of the dams and let ‘er flow the way God intended – but I’ll keep an open mind for now. As always . . .
I’ll take the river’s side. Industry and Big Agriculture have plenty of powerful friends in high places. Thank you for visiting our blog, please share it with a friend. You may contact us by leaving a comment here or via email: joe@lenthofthegrand.com (Joe Neely) or tom@lengthofthegrand.com (Tom Neely). 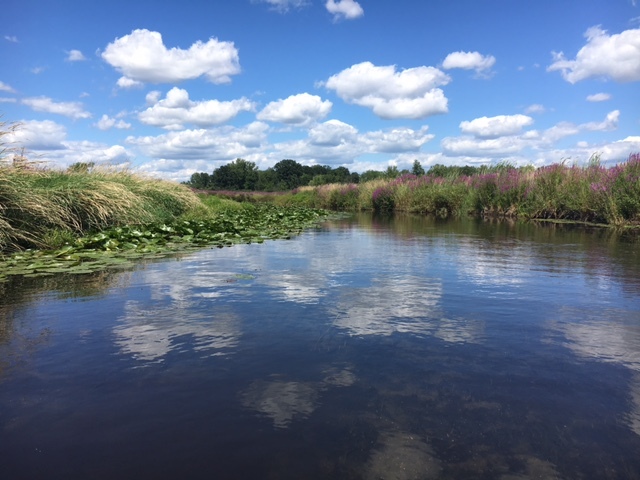 This entry was posted in Environment, Michigan, rivers, Uncategorized and tagged brothers, Ferrysburg MI, Grand Haven MI, Grand Rapids MI, Grand River, Grandville MI, kayak, Lake Michigan, Michigan, PFAS. Bookmark the permalink.